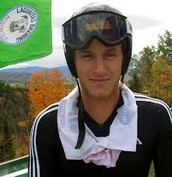 24 year old Ski jumper, Anders Johnson is participating in the 2014 Olympics on the US team. He has been competing since 2002, and participated in two Winter Olympics. 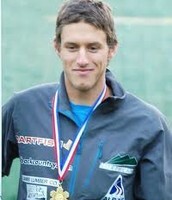 One of Johnson's main accomplishments was finishing 11th in the team large hill in Vancouver in 2010. Johnson will undoubtedly lead the US team to success this year. Anders will participate in the Men's Normal Hill Individual - Qualification on February 8th at 10:30 AM (CT), as well as the Men's Normal Hill Individual on February 9th at 11:30 AM (CT). Anders, a medalist, after a successful jump. Anders in action during a practice run. Anders had an outstanding record- the 24 year-old athlete has competed in many events, and even also the winner of the 08' and 09' National Jumping title. 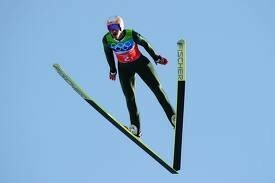 He's even tied with another US ski jumper, Peter Frenette. Qualification Complete! Now Let's Compete! On February 8th, Anders qualified to compete in the Men's Normal Hill Individual. In this event Anders completed a total of 107.9 points. Not quite his best jump, but he's getting there. While he competed in the actual individual race, Anders only finished with a total of 104.2 points. Let's see what Anders has in store for the Men's Large Hill Individual!